Freshen up your spring and summer menus with this fresh, inviting salad. - Mix marinade well and marinate duck breasts overnight. - Grill duck on medium heat for 12 minutes. - Julienne duck breasts and cool. - Boil and strain remaining marinade and use as a dressing for mixture. 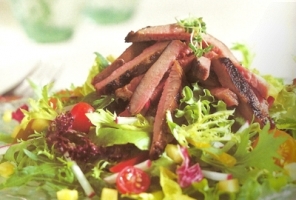 - Place Mesclun mix in large bowl with duck; add radishes and tomatoes. Garnish with pineapple and top with red pepper and sprouts.